One of the major concerns for embedded devices is the power consumption. If the device you’re designing will be battery powered, it’s indeed important to reduce as much as possible its power consumption to maximize the autonomy (= the working time before it’s necessary to replace or recharge the battery). In this first post about the esp32 power saving modes, I’ll explain the deep sleep mode. When the chip wakes up from deep sleep, a new boot sequence is performed. It’s therefore very important to understand that the execution of your program does not restart at the point where the esp_deep_sleep_start() method is called. Let’s see how to configure and use two wake up events; in a future post I’ll write about touch pad and ULP. In a previous post I’ve already blogged about the possibility to receive interrupts when a digital pin of the chip changes its status. We can leverage a similar functionality to wake up the chip from sleep. you can enable the wake up if the specified pin (gpio_num) changes its status (level). When the chip wakes up from the sleep, the pins specified will be configured as RTC IO. To be able to use them again as normal digital pins, you have first to call the rtc_gpio_deinit(gpio_num) method. The ext0_wakeup method at the moment cannot be used together with touch pad or ULP events. As explained above, in deep sleep mode the content of the RTC fast and RTC slow memories is preserved. You can therefore use those memory segments to store data that must be retained during the sleep. I hope any one of you could help me. Did anyone had an hint for me? Thanks a lot Luca! You made my day! Grazie del tuo video, mi sarà molto di aiuto nel progettino che sto realizzando. Vorrei costruire un tastierino wireless bluetooth usando un comune matrix keypad a membrana e ESP32. Il mio problema è che vorrei sfruttare il deep sleep e risvegliare il dispositivo solo quando l’utente digita qualche tasto. Mi accontenterei anche di perdere la prima cifra digitata eventualmente. Tu che consigli mi daresti per realizzare questa cosa? Grazie mille! Ciao Alessandro, quei tastierini normalmente sono gestiti come “matrice”, quindi penso si possa usare il wake sui pin di I/O a cui hai collegato il tastierino! buon diverimento! Si certo, però il problema è che dato che sono gestiti a matrice, per poter capire quale tasto è stato premuto, si cicla sulle righe (collegate ai pin di output) e si da livello logico alto, andando poi a leggere le colonne per capire quale tasto è stato premuto. Per questo motivo, diversamente dal pushbutton che è sempre “alimentato”, gli switch della matrice sono alimentati a rotazione ma solo mentre il codice è in esecuzione. Forse ho capito male io, me lo confermi? Grazie ancora! Any compatibility with Time.h Library? Yes, this library is for Arduino, but it can use with ESP32. 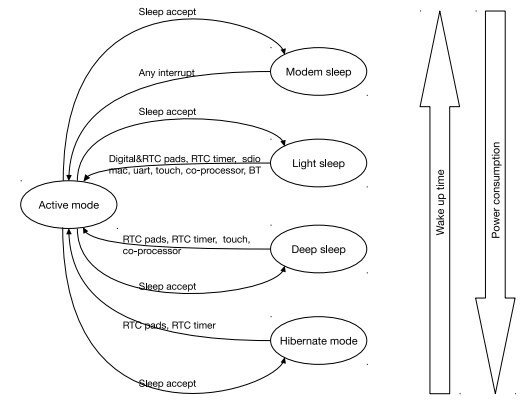 In general words, ¿can we store real time variables in deep-sleep mode?